Christmas paintings usually feature exhaustively explored, familiar events surrounding the birth of Jesus - in short, the stuff of popular Christmas cards. Despite that, the Park Cities Presbyterian Church in Dallas has themed this year's exhibit as "The Manger, The Magi and The Majesty". A baby now born to pay that dear price. I suppose they have a reasonable expectation of artists infusing this theme with a contemporary twist in either media or content! Of course, I love a challenge and I'm certain that the rest of the art community does as well! It forms the very fiber of who we are as artists. The Proclamation is based on Luke: 2:13 . I suppose that it would fall comfortably into the Christmas painting category. Painted on a 30x40" canvas in acrylic, it attempts to explore what that first moment in time must have felt like to those humble shepherds when their eyes were opened to the spiritual world. Were they cold, afraid, or just awestruck? Perhaps the animals grazed unperturbed; there could have been nothing alarming about the event for them. After all, does their Creator not care for them daily? They always seemed more spiritually astute than their human owners (remember Balaam's donkey?) I could not resist including the abstract pattern of the cross, etched on the rocks in the foreground, hinting at events to come! This show has always been open to a wide variety of artists working in multiple media. 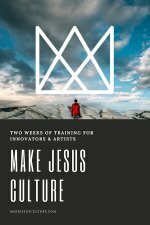 It is usually a delight to see how effectively a theme-based show, combined with a healthy competitive spirit, stimulates the creation of a broad range of Christian art. This show will most certainly draw more than the Christmas card variety of Christmas paintings! In fact, because of my passionate interest in sculpture, I am curious to see the three dimensional entries to this show. I plan to enter two works for the exhibit; whether one, or both, will be juried into the show, will be the decision of the jurors. Mulling over the themes and finally creating the works above was immensely satisfying. It is also fun to share the work here. 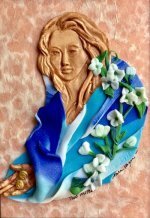 My other "Christmas painting" is not a painting at all, but rather a polymer clay relief sculpture that is significantly smaller than the acrylic, only 12x24". The Gifts for the King is about the gold, frankincense and myrrh that were presented as offerings. I used polymer clay and gold foil on a multi-media board. I imagined that brief fragment of time when the Magi acknowledged with their humble gifts, the presence of the King of Kings in their midst. 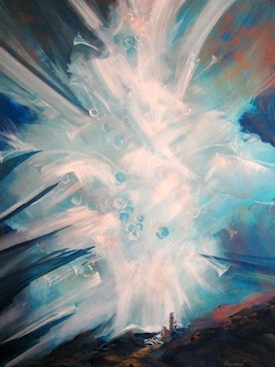 Perhaps, the scene shone with a divine light transforming the ordinary, for just an instant. Then like a common play, the lights were turned off and the stage went black once more. The rest of the story had to then unfold with blunt brutality in the ordinary light of the dusty earth, culminating in the harsh eventuality of the cross. Oh, that men were as wise today as the Magi to see in that divine light, the truth of His authority over all creation!